Buying a home is one of the biggest financial decisions you’ll ever make and your mortgage repayments are likely to be your largest monthly expense for years, so it’s important you find the best deal for you. In this article we compare the best mortgage rates currently on offer to first-time buyers. If there's one bill you don't want to overpay on it's your mortgage! Below you’ll find a comparison of the best variable rates currently available to first-time buyers, followed by the best fixed rates. These comparisons were made using the following figures: a first-time buyer seeking a mortgage of €225,000, over 30 years, on a property worth €250,000 i.e. 90% loan-to-value ratio. *These rates are reserved for customers who also hold a current account with the bank. Find how switching current accounts could help you get a better mortgage rate. **Discounted rate for one year. Rate reverts to 4.20% from year two onwards. ***Aimed at the self-employed and those with a non-standard employment type e.g. contractors. From the above table, we can see that the lenders offer a variation of rates and keep in mind that they also offer different incentives to sweeten the deal - designed to entice you to choose them over another provider. For instance, both AIB and KBC are offering discounts off home insurance (30% and 25% respectively), Ulster Bank is offering €1,500 towards legal fees, Permanent TSB is offering 2% of your mortgage back in cash, BOI is offering 3% cashback if you have a current account with the bank, while EBS recently increased it cashback offer to 3% also. Offers such as these are certainly worth considering and it’s particularly easy to understand the lure where cashback offers are concerned - it’s wonderful to finally secure your dream home with a mortgage but it’s not much good if you can’t afford to furnish it! Using the same example from above, if you were to take out a €225,000 mortgage with EBS or BOI, the 3% that you would get back in cash would give you €6,750 in total (€4,500 upfront and €2,250 after five years), which is certainly nothing to be sniffed at. Permanent TSB has also recently made moves to sweeten its cashback offer even further; in addition to the existing 2% cashback at drawdown, the bank will also give you 2% of your monthly mortgage payment back in cash each month provided the mortgage is paid from a Permanent TSB Explore Account. Certainly tempting, but before you’re swayed by any lucrative cashback offers, spend an equal amount of time considering their value over the lifetime of your loan. It also hardly goes without saying that the above-quoted rates are variable, so will be subject to change. This means that the cost of your monthly repayments could go up, or down, over the course of your mortgage depending on whether interest rates rise or fall. 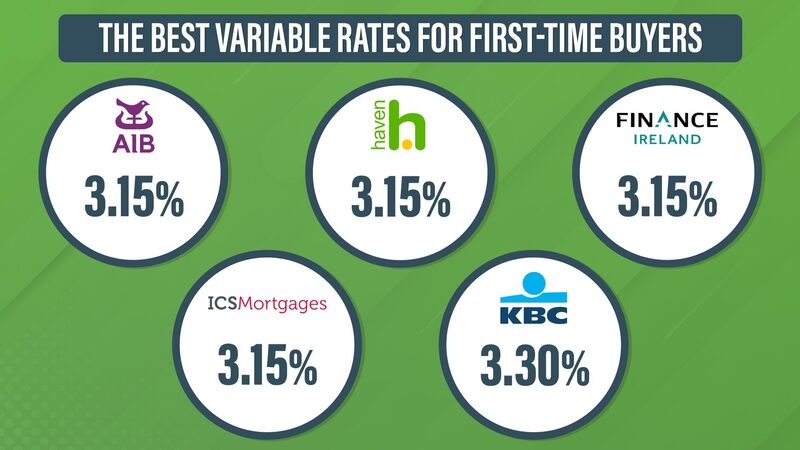 From a quick glance at this second table, it would appear that fixed-rate mortgage customers are getting a better deal compared to variable rate customers. This is true - for now - and fixed-rate customers can take comfort in the stability that fixed rates afford. They can rest easy in the knowledge that their rate will not increase for the duration of the fixed term. However, it also means that they won’t be able to benefit from falling rates and it could well be the case that the customer on the variable rate ends up paying less in the long run than those on fixed rates. In terms of incentives and cashback deals, all the banks are offering the same incentives to fixed-rate customers as they are to variable rate customers as outlined above. Fixed rate versus variable rate? One of the big decisions in the mortgage application process is to decide whether you’re going to choose a fixed or a variable rate. Each has its own advantages and disadvantages but ultimately, the most appropriate type of rate for you will come down to your personal preferences, your financial situation and the value that you put on stability and predictability. 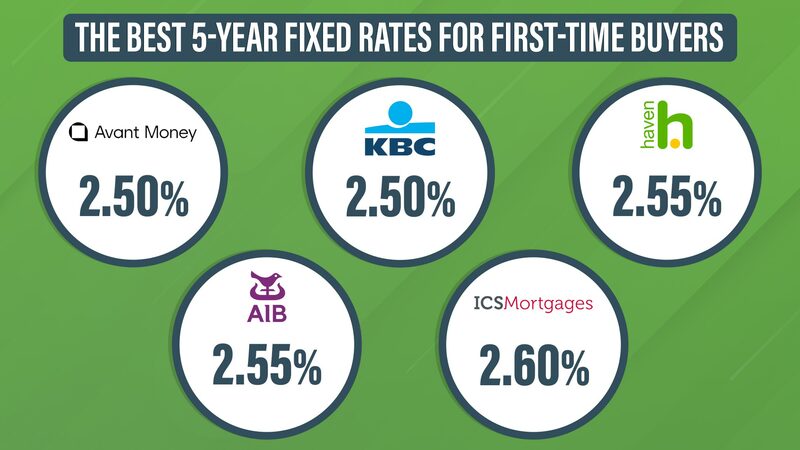 Though variable rates have traditionally been the more popular option in Ireland, the popularity of fixed rates has been on the rise for the last while, so don’t be too quick to write one type off over the other. Be aware that the above options are not exhaustive and are based on a single example. You might have better options, for example, if you have a bigger deposit and therefore a lower loan-to-value ratio. You might also prefer the added peace of mind of a longer fixed rate, over 5 or 10 years, which tend to have slightly higher rates of interest and therefore didn't make our list. To be sure that you’ve considered all of the options available for your particular circumstances, run your own comparison using our mortgage calculator. It’s quick, free and easy to do and will certainly help you on your journey to purchasing your dream home.